I received an unusual phone call today. A woman called me from Cincinnati, Ohio, to ask if I had any relatives in the area. She had been at an estate sale earlier in the day, and a Purple Heart awarded to a Sellers was one of the items that had been for sale. I don't know where she found my name, but she thought perhaps it might be a relative of mine. I told her I did have relatives who had moved to Ohio, though I didn't know of any in Hamilton County, and I was at least interested in knowing to whom the Purple Heart had been awarded. She went back to the estate sale and discovered that several buyers had objected to the Purple Heart being sold and that it had been pulled from the sale and returned to the woman who owned the property -- who then turned right around and sold it on the side to an individual. The woman who called me was very upset that the Purple Heart had been treated so cavalierly. I did a little research online to try to find out what should have been done with the medal. I found a reference stating that lost medals and other military items should be returned to the Secretary of Defense, but nothing about the proper protocol when family members don't want to keep medals. Apparently the woman who sold it was the rightful owner, and she had no interest in keeping it. I appreciate the kindness of the woman who called me, who was hoping that if the medal were to be sold, at least it should go to someone who was related to the person who had earned it. I hope the person who purchased it gives it the respect it is due. 1) All U.S. medals are serial numbered and the person who received it can be found through military records. There may be a huge amount of research involved in this but any medal recipients were generally mentioned in the "Orders of the day" and other official documents other than the actual citation. 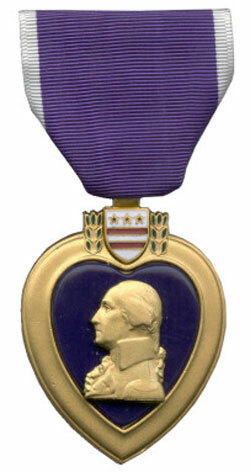 2) There is a list of Purple Heart recipients on Wikipedia but I certainly can not vouch for its accuracy. Contacting purpleheart.org is another avenue. 3)Per the "Stolen valor act of 2005" the sale of ALL U.S. military medals is forbidden and doing so is a Federal misdemeanor.